Health Secretary Patricia Hewitt said she should be judged on resolving the financial crisis in England's NHS, after its head resigned. 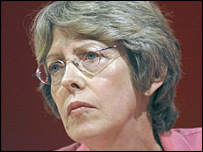 She repeated government denials that the head of the NHS in England, Sir Nigel Crisp, was forced to quit because of predicted record overspends. Measures were in place to bring the NHS back into the black by the end of the next financial year, she added. Sir Nigel acknowledged "accountability" for the problems as he quit on Tuesday. But the Conservatives said the government was seeking to blame Sir Nigel for the financial crisis the NHS was facing. Ms Hewitt said she was accountable for NHS cash problems in the NHS which emerged soon after she took over as health secretary last May. Speaking on BBC Radio 4's Today Programme she said: "I take responsibility for this. "What I'm focusing on is making sure that we go on delivering the improvements in patients care - the 18 week maximum from GP referral to operation that we've promised by the end of 2008. "Of course I expect to be judged on my success our success in achieving that and in restoring the NHS to financial balance over the next financial year." Sir Nigel, 54, who has been chief executive since November 2000, has overseen huge spending increases and waiting list falls to record lows. But he also said he was "saddened" by the financial problems that emerged under his leadership. "As chief executive I wish to acknowledge my accountability for these problems, just as I may take some credit for the achievements," he said on Tuesday as he announced his early retirement. NHS managers have reported that operations are being delayed and wards closed as they struggle to balance the books. The government predicted a possible deficit of £620 million back in December, but no one really knows what the figure will be at the end of the financial year. Many health trusts have cut posts or brought in recruitment freezes. Ms Hewitt said officials were focusing on keeping deficits as low as possible but would not be drawn on how big they were. She said: "As soon as we have got the end of year figures I will publish them. "But we are focusing on the steps we have to take for next year in bringing the service back into balance." Niall Dickson, chief executive of health think tank the King's Fund, said Sir Nigel had been under pressure from the government over the deficits. "Getting round the financial problems has to be the top priority. It's not going to be easy to do that." Following Sir Nigel's departure, the NHS chief executive's job will be split. Sir Ian Carruthers, who is the Department of Health's acting director of commissioning, takes over as acting NHS chief executive. Hugh Taylor, the director of strategy and business development, becomes acting permanent secretary. Liberal Democrat health spokesman Steve Webb supported the move to split his the roles into head of the NHS and permanent secretary. He said the NHS needed a boss who could sometimes tell the government that the policy being pursued was damaging the health service. Just how well is NHS money spent? The end of hospitals as we know them?